I spent most of my childhood scared stiff. As the youngest in a family of seven (five kids), I was first to bed. 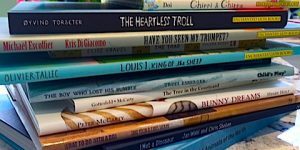 There were no bedtime stories. I don’t recall being tucked in. It was ‘get to bed’ and that was it. Light on in the hallway. Door open. Once I was under the covers, I did not move a muscle or shift a single finger, for fear that I would disturb whatever or whomever was lurking in the shadows. It didn’t help that I would often smell fried baloney in the downstairs kitchen, as if the party started once I went to bed. Otherwise innocuous early 70s television theme songs like Mission Impossible wafting up the stairs deepened my anxiety, becoming synonymous with my banishment. Forty years later I no longer remember what I was afraid of, just a vague recall of the anguish bedtime represented. 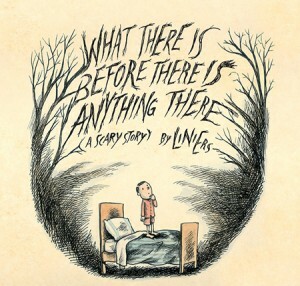 What There is Before There is Anything There, the newly translated book by the Argentine cartoonist Liniers, is a perfect reflection of that nameless fear. The boy in this story, like every similarly afflicted kid, knows that once the lights are turned out and ‘the ceiling disappears’, the dark is not empty. 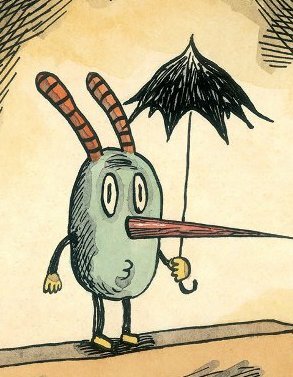 Indeed, as he lay in bed, the first in a series of strange little creatures descends from above – on an umbrella. It stands at the foot of his bed, staring and silent, and yet its lips are pursed, as if whistling. One by one, the rest of the creatures appear, surrounding the boy’s bed. None of these ghouls are particularly scary, and in fact are rather whimsical, but their wordless vigil is incredibly unnerving. Once all the creatures have gathered, the dark void takes shape, transforming the bedroom into a nightmarish wood. 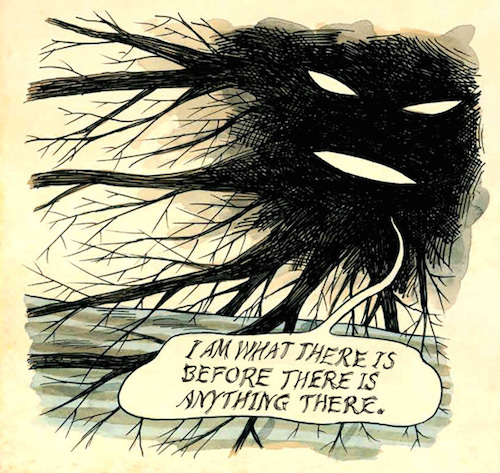 Gorey-esque branches surge toward the child, and a face appears in the murk. The boy runs to his parents’ bedroom, where he is the recipient of that time-honoured parental admonishment – it’s just your imagination. When you’re a kid, there is no room for subtlety. It’s all real. 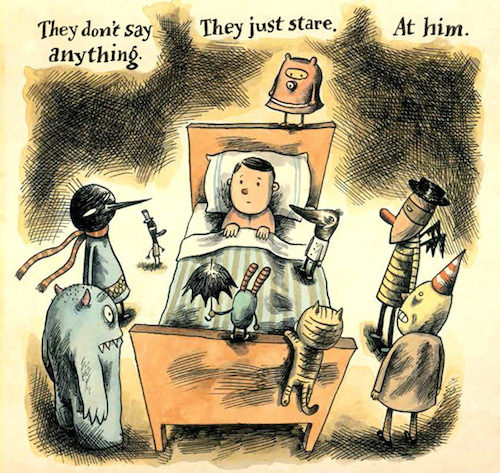 Unlike so many ‘scary’ kids books, Liniers does not rationalize, dismiss, or even resolve the boy’s fear. It is what it is. Indeed, when the boy is allowed to sleep with his parents ‘for the last time’, the creatures follow him (or at least the little guy with the umbrella) to bed. It is a devilishly mischievous ending, and it made me giggle. Individually, these nightly visitors are not particularly threatening, and in a less menacing context they could be the boy’s imaginary playmates (with the exception of that, um, bit of weirdness in the dark). 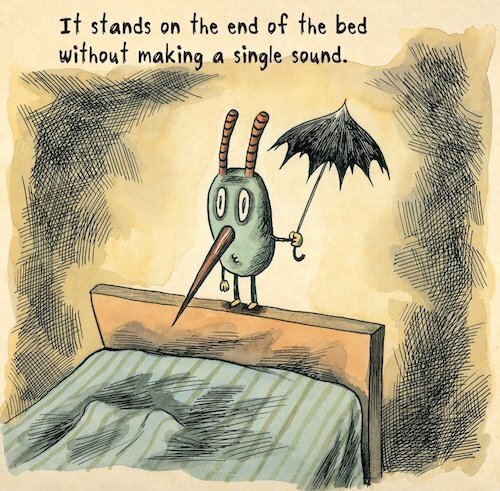 Liniers is, after all, a cartoonist, and while the story may be nightmarish, his gorgeous watercolour and pen illustrations (in particular his characterizations of the boy and his bedtime crew) are little gems of wicked humour and expert draftsmanship. What There is Before There is Anything There is a validation of the imaginative mind, regardless of where it leads. As the title suggests, making something out of nothing, literally pulling it out of the darkness, is the very essence of imagination. Some children (and adults) might think this book too scary, but others will find the boy’s predicament familiar (as I did), and therefore reassuring. Most will appreciate the humour. 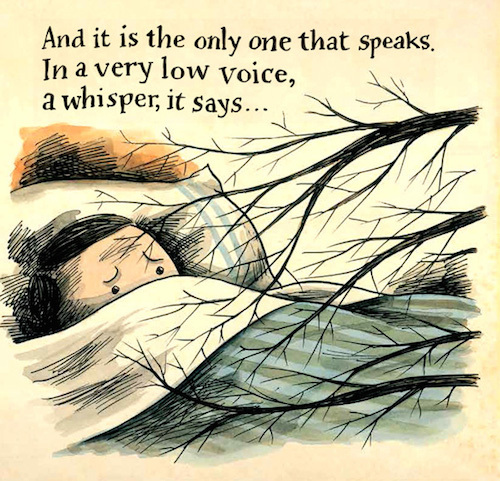 As Liniers is keenly aware – it’s fun to be scared, and What There is Before There is Anything There is a lot of fun. Liniers (full name Ricardo Siri Liniers) is an internationally well-known Buenos Aires-based cartoonist, whose daily comic strip Macanudo has run for over ten years in Argentina’s La Nación. 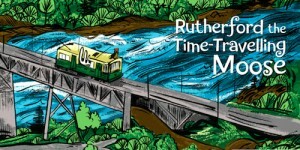 His work has appeared in newspapers, books, and magazines, including The New Yorker and Rolling Stone. 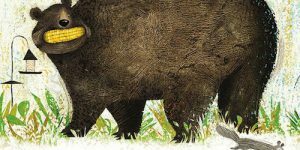 Liniers’ first North American picture book, The Big Wet Balloon was named a Parents Best Book of the Year. On the dedication page of What There is Before There is Anything There, Liniers states, “…to my parents, who turned out my light and lit up my imagination.” Perhaps, just perhaps, What There is Before There is Anything There is not just a quirky picture book, it is also an autobiographical story of a kid who grew up to be a brilliant artist. Slowly I am making my way through Poly Bernatene’s picture books. The Argentinian illustrator is astoundingly good, and very prolific. His latest book, Ribbit! is, like the others, a feat of illustration. Unlike the others, there is no blue, as in the colour blue. 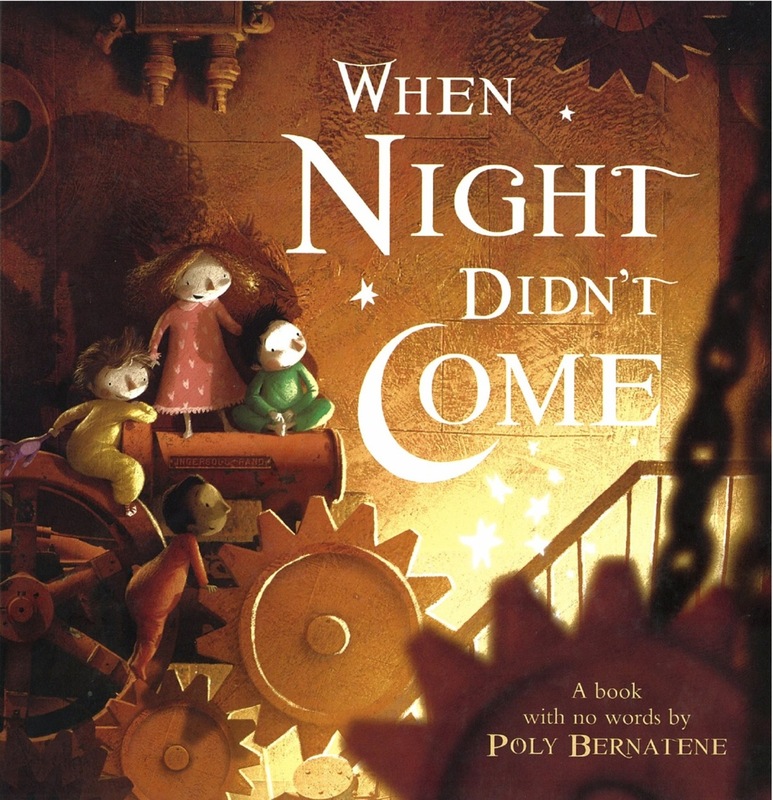 There are wonderful greens and pinks, but for anyone who has seen When Night Didn’t Come, The Tickle Tree, or The Santa Trap, they will understand, Bernatene immerses his illustrations in deep sapphires and lustrous periwinkles. 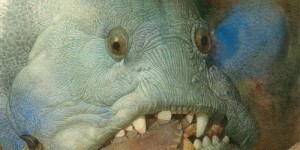 Nevertheless, what Ribbit! lacks in blue, it more than makes up for in the number and quality of frogs, and a friendly, if slightly misunderstood pig. 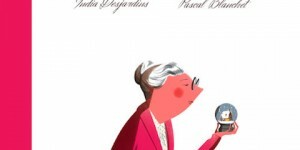 Beautiful Griselda is a fairy tale about the perils of narcissism and the difficulty of keeping your wits about you, especially the parts of your anatomy containing your wits, when confronted by the object of your desire. I think we can all relate…to a degree. Princess Griselda is beautiful. Really, gobsmackingly beautiful. Everyone who casts their eyes upon her lovely visage falls head over heels in love with her. Literally. Their heads pop off like corks. Griselda is greatly amused by this, and makes a collection of her admirers, varnishing their heads and placing them under glass or on the walls like stuffed trout. Yes, grisly Griselda is a bit of a monster, more interested in perfecting her lethal form of beauty and growing her ‘collection’ than finding a nice little froggie to kiss. Lucky froggies. To keep the princely heads rolling, Griselda’s daily beauty ablutions include bathing in cold spring water, slurping juice from sour Tasmanian fruit, posing in crystal shoes, and of course, stray hair removal, courtesy of her ladies in waiting (to have their heads pop off.) And, like all narcissists of the royal persuasion, Griselda takes more than a little pleasure in knowing that people throughout the land are obsessed by her beauty, misinterpreting fear for admiration. Buy it, or borrow it. That’s my recommendation, and the sum of my review. 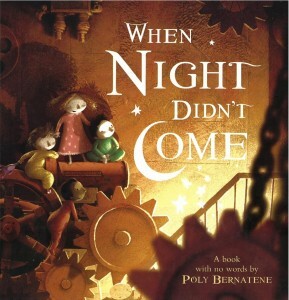 When Night Didn’t Come is beautiful, astonishingly and almost indescribably beautiful, and it belongs in the library of anyone who appreciates, collects, and occasionally slobbers over illustrated children’s books of the most exquisite quality. No, you can’t have my copy. 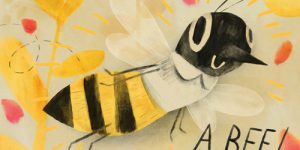 Poly Bernatene’s recent publication is a wordless picture book, and I’m not entirely sure I would have been able to follow the narrative without the description on the back, and of course, the title. It begins at sunset with a yawning sun. The sky darkens, but the glow remains. Where is the moon? Where is the night? And why is the sky full of dirigibles?